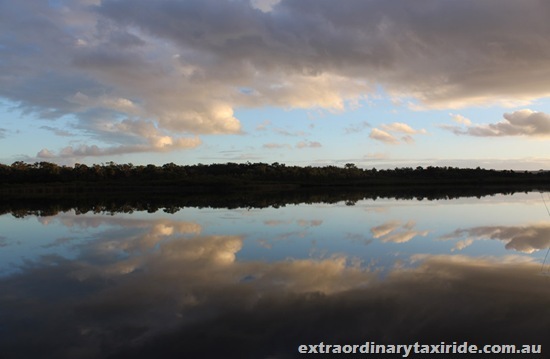 Did you know about the 2 Malaysians who travelled around Western Australia in a taxi? Dr Ling and his brother Shaun won a contest organized by Tourism WA. Their prize was being driven round the largest state of Australia in a taxi. Going through their blog and those by the other winners, some emotions in me were inevitably stirred up. 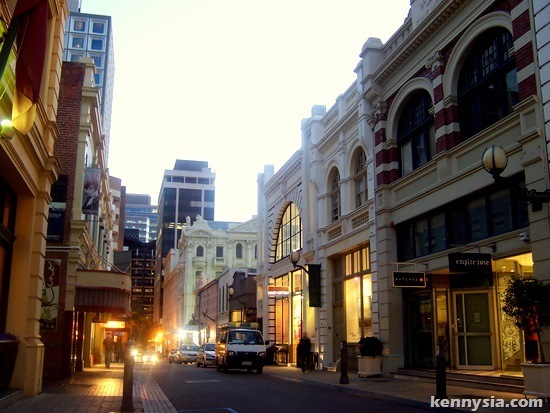 To me, Perth is more than just a tourist destination. Perth was my former home. And although I have moved back permanently to Kuching now, I'd still hop on a plane and see Perth all over again if given the chance. At least AirAsia is flying to Perth soon! 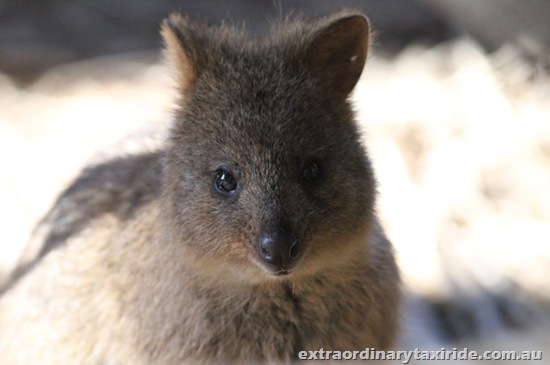 What's there to see in Western Australia? HEAPS. In fact, I give you 10. It's not as big as Melbourne or Sydney, but the walk through the shops and malls of Perth City is still very pleasant. All the charming old buildings like the Post Office and London Court are very well-preserved. I enjoy coming here on Friday night after work when all the shops close late. When I get hungry I'll just walk to Taka for cheap authentic Japanese food, or Utopia for Taiwanese bubble tea. King's Park is lush botanical garden located on a hilltop overlooking Perth city and the Swan River. It's a very well-maintained park with lots of flowers, trees and walking paths. My ex used to live in an apartment here and every morning we'd see old people jogging up and down the steep jogging paths. I never tried jogging there. I get tired just looking at them do it. It's a quaint port town 45 minutes away from Perth. Fremantle got more laid back atmosphere without the bad behaviour. 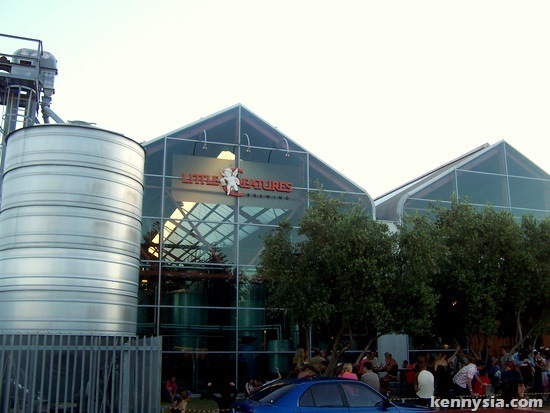 It's where I'd come to chill out, eat fish and chips at Cicerello's, drink coffee on the Cappuccino Strip or chow down some pizza and beer at Little Creatures microbrewery. I went to and fell in love with Rottnest Island when my student union organized a leadership training camp there once. Rottnest is a small island 30 minutes by ferry from Fremantle. There are no cars here so the only way to get around is by bicycle. Beautiful bays and beaches are the attractions here, but to see the real beauty you gotta put on the snorkel mask and look underwater. Rottnest Island is the reason I picked up snorkelling, and eventually diving. People travel to Margaret River for two things: nature, and wine. (Or whine, if you don't drink wine). If you drive down the freeway during spring, the huge expanse of wild flowers on the either side of the road literally takes your breath away. This is the only place in Australia where people can experience white sandy beaches, gigantic forests, agricultural life, ancient caves and world class wineries all in one area. It's also a romantic place to bring a special someone for an overnight stay at a Bed & Breakfast. 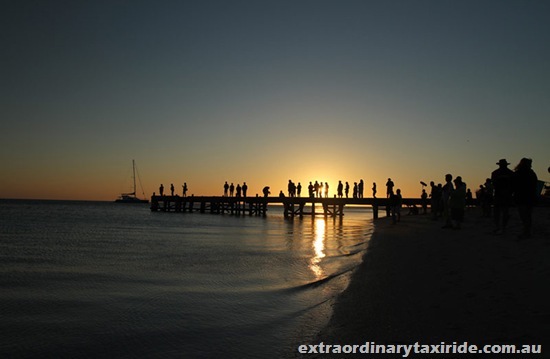 It's a popular stopover for most people heading northwards to Ningaloo Reef. 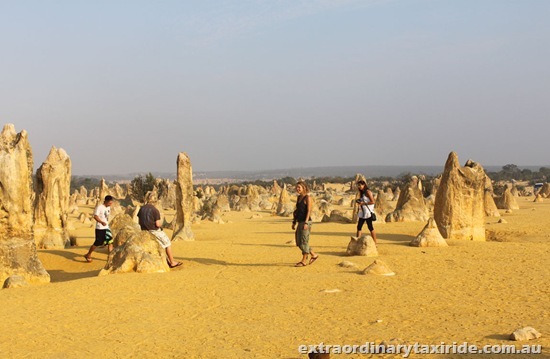 The Pinnacles is located in the middle of a sandy desert. It's impossible for normal cars to access it, which means you gotta hop in this gigantic 4WD monster truck if you wanna see this unique landscape of towering rocks rising over the sand. There are only two places in the world I know where you can go surfing inland. 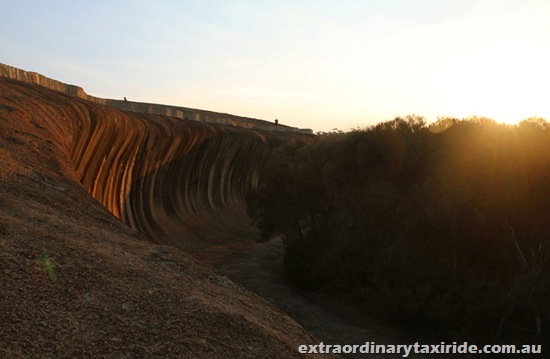 The first is at Wave Rock. The other one is at Internet Cafes. Monkey Mia is a back-aching 6 hours north from Perth by car. Despite what the name tells ya, there are no monkeys in Monkey Mia. But there are dolphins. 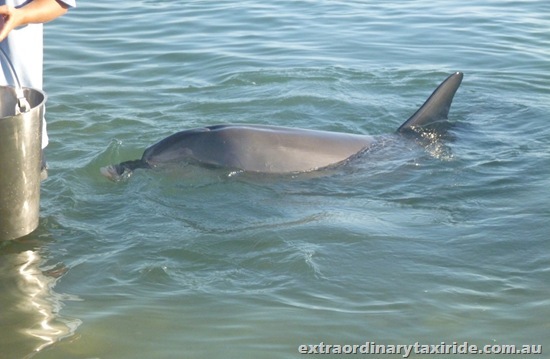 Every morning, these wild dolphins swim up to the shore and it is possible to pat and feed them. WA's Ningaloo Reef may not be as famous as Queensland's Great Barrier Reef, but surpasses it in beauty. 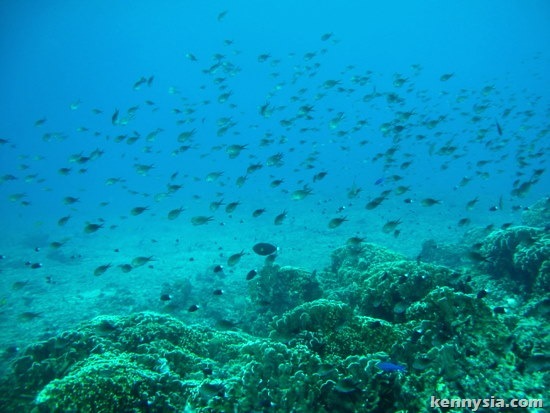 Because it is so difficult to get to, it gets less visitors and therefore less damaged marine life. 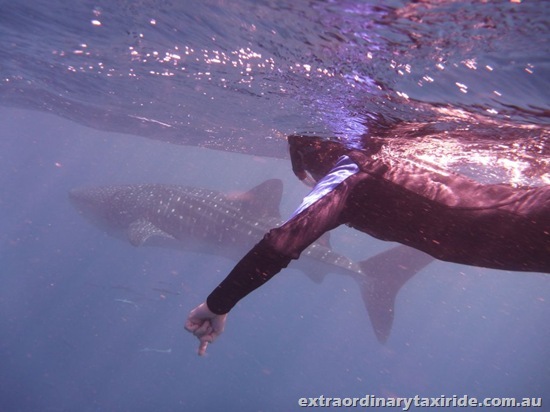 It's popular for being the very few places on Earth to dive with gentle giant whale sharks. Let's face it, the biggest reason Malaysians come to Perth is to study. Many Malaysian colleges have twinning programmes with the Universities here. It's only a 5 hour flight from KL and airfares aren't too expensive now that AirAsia flies to Perth. Chances are, you already know somebody who's doing a course over there. Maybe it's time to pay them a visit. 'Cos what the heck - when they graduate, you won't have anymore free tour guides! I went to Perth last year and absolutely loved it. Some of my friends said its boring but I regret only spending 5 days there as it's not enough.. Didn't get to see the Wave Rock and Monkey Mia! Anyway our tour guide just walked us into the Pinnacles Desert, no chance to ride the Monster Truck lol. 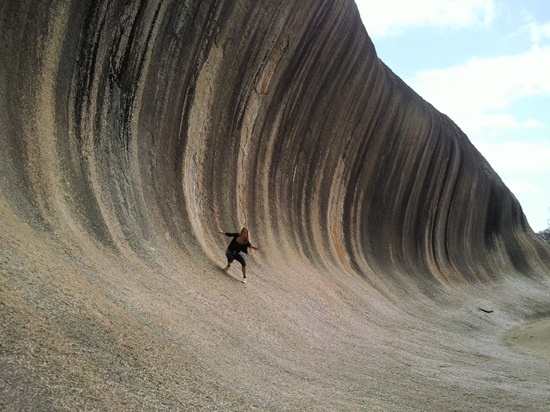 We did do sand boarding at Lancelin in something similar though, haha. We went as far as Cape Leeuwin in the south for the lighthouse too.. and oh i miss Cicerello's! Damn gotta make a trip there again hahaa. I visited Perth last Sept. I love the city. Visited several places out of Perth during my trip. My travel experience to Rottnest Island wasn't too pleasant due to the weather that day - rainy, cold and windy. Plus the ferry ride was choppy. I almost barfed. Nice pictures and descriptions of the wonderful places in Perth. Might plan to visit there some day. Anyway, this might not be important but I noticed the numbering in the list is a bit off. It is missing a number "2" (with two number "5"s) and number "3" comes before "5" and "4". Is there a reason for it? ex-ECU student here! I'm going to perth for holiday. woohoo..I miss perth so much. awww, perth. it's been 10 years since i left Curtin. you're right about one thing, there are a lot of free tour guides for students. yeahh... going to perth in 3 weeks! Eh, some error in the numbering? 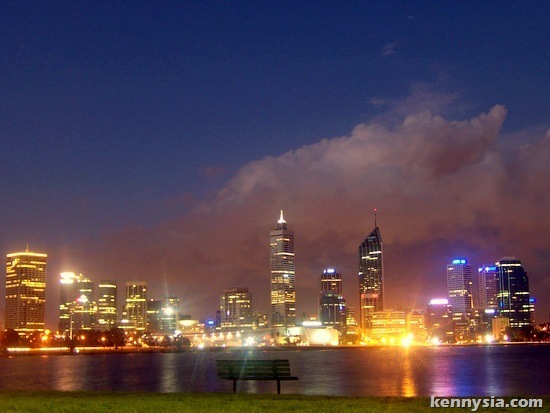 aww...i miss Perth so much...i MUST go back there one of these days..
will it be good in july during winter?? From your pictures, i can still fondly remember all these places from my 1999 visit. love King's Park, Wave Rock, Pinnacle Desert, Margaret River and Fremantle. 2 other places that are nice to visit are Fremantle Jail (disused since 1990s, now an attraction) and Perth Mint (where you can see how money is made literally). Looks like I need to take a trip to Perth. You can't even number your points correctly and in orderly fashion ... is it too much to ask? LOL! "..This is the only place in Australia where people can experience white sandy beaches, gigantic forests, agricultural life, ancient caves and world class wineries all in one area..." --- False. You can easily do all this over at Port Stephen(off Sydney)too. 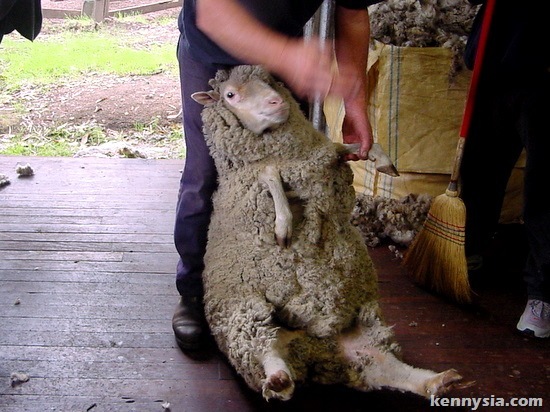 Kenny boy, do get your facts/points straight! (pun intended) LOL! Oi! Oi! Oi! am in perth now, and i absolutely love this city to max. It might not be the best attraction in oz, but it is at least a comfortable place to stay and visit. The blog is no longer entertaining nor interesting. i am still in perth right now but graduating and going back soon. tears rolls down when i think about the whole 5/6 years that i've been here. It's been my home away from home.. I Love Perth. im gonna miss all the road trips! 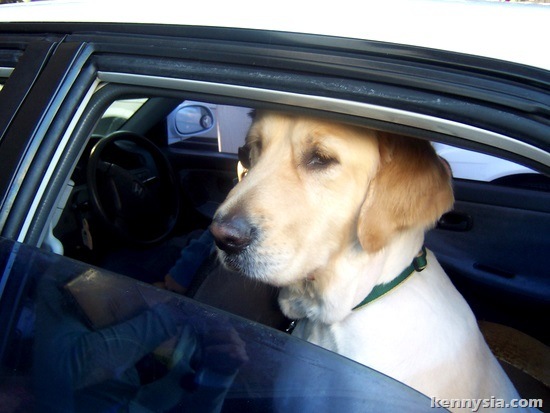 It may just be me, but did you write that post Kenny? The grammar isn't very Kennysia-like me thinks. Lil' Creatures. FAVORITE BEER EVER! Ah. Perth. My greatest bane. It's so cold now at night!!! Hmm... my fingers seems to be clicking the AirAsia website... wait it's moving the cursor towards..... Perth?? Haven't been back to Perth since graduating in 1988. Spent 6 years there and love every moment there. Don't rush in Perth. Take your time to absorb the place. I'll be back. Great recommendation! I will definitely go to these places when I go to Perth! And guess what, you did reverse the impression I had on Perth. It looks more interesting than I thought. Kenny sia?Are u sure u want to employ someone else to write the blog for you?C'mon la where re u? I'm now in Perth, and I definitely do not regret the chance to come here to study. Coral bay is another place which is worth visiting, provided if you like water activity such as snorkeling. It's a shame that Araluen has been close down, cuz that's another place worth visiting especially if you're a flower lover. Nice blog you have there. I also surf Cheesie's blog sometimes but I shan't anymore because her blog has got a virus as my new computer is telling me. My other computer broke down, because I used to visit her blog?? my friends and i plan to go on a road trip after our exams. Perth is so small and we have no idea where to go. Monkey Mia sounds good and we might just go there!. 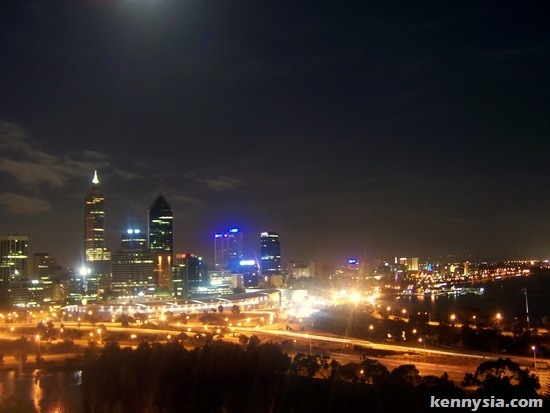 OMG..I miss Perth so so much.Spent a year over there for my final degree year with Murdoch University but it was definitely one of the best experiences I'd ever had in my life.So going back to Perth for a long holiday next year!! WHAT IS THAT AMINAL (purposely wan)IN THE 7TH PHOTO! SOOOO KEEEYOOOTE! 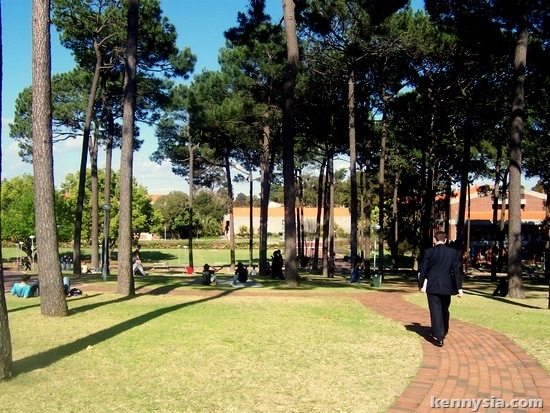 i'm a student in curtin too and this would be my final semester here. I'm going to miss this place, a home away from home. I don't want to leave!! the uni, the variety of food, the pasar malam, Perth Royal Show, the events. I'm still in Perth but I'm missing this place too. Late night shopping on thursday, late night shopping on friday in the city. 3:37 AM, 17 June 2010 | Link | Reply annoy.ing. we had been to Pinnacles a year before, and cars are allowed to access. don't think the management expect tourists to walk around under the scorching hot sun. But I have never heard of the monster truck you mentioned in Pinnacles. 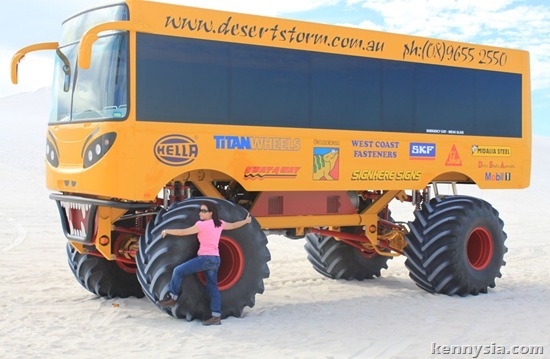 I had once have a chance to ride on this monster truck in Lancelin, for sand boarding. Fun experience I would say! i'm sure i'll love perth!